The worst part of being dead is that there’s nothing left to live for. No more kisses. No more secrets. No more Gossip. It’s enough to kill a girl all over again. But I’m about to get something no one else does – an encore performanc, thanks to Emma, the long-lost twin sister I never even got to meet. Now Emma’s desperate to know what happened to me. And the only way to figure it out is to be me – to slip into my old life and piece it all together. But can she laugh at inside jokes with my best friends? Convince my boyfriend she’s the girl he fell in love with? Pretend to be a happy, carefree daughter when she hugs my parents good night? And can she keep up the charade, even after she realizes my murderer is watching her every move? I blasted right through this book. Took me two days, but that was only because I had to work. I loved Emma. I felt so bad for her when she finds out about her long lost twin sister, only to discover once she arrives in Tucson that she has been murdered. I find it hard to believe however that once she inserts herself into Sutton’s life to find out who killed her, Sutton’s friends and family don’t even think to question why “Sutton” would be so different all of a sudden. The friends and sister all have some kind of motive, and each time a clue is dropped in your lap you start thinking you know who was behind Sutton’s death, until another clue turns up pointing in some other direction. This book kept me guessing until the very end, and even then I’m still guessing. 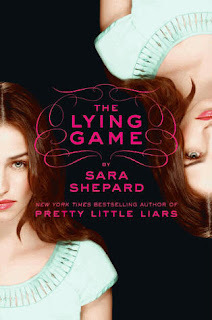 I cannot wait to devour the next in this new series by Sara Shepard. Oooh looks good if you want to ‘devour’ the next book! 🙂 I’ll have to read this one soon!